Please find a list of downloadable forms below that will help you get started as a new patient with our center. All other forms will be provided to you once you have visited our office. For further information, please contact us at 850.ADD.POSH (850.233.7674). Financing is an excellent option for many patients. We have been working with Advance Care® & MedChoice Financial, which we have found to be realistic, reasonable, and user-friendly. In case you are considering financing options for your procedure, we encourage you to visit the Advance Care® or MedChoice Financial web sites and, hopefully, get pre-approved prior to your visit. An affordable option for anyone requiring financing. You may apply on-line and receive a fast credit decision on your application. Click on the image below to visit Advanced Care Card web site. 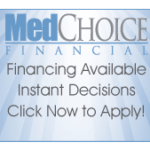 Click on the image below to visit MedChoice Financial web site.